MCC's Health Project in Mongolia is helping create the right conditions for economic growth. Heart disease and stroke account for more than one-third of all deaths in Mongolia. And, though they are among the most preventable of diseases, they are also among the most widespread and costly health problems facing Mongolia today, according to the World Health Organization. The Health Project, part of the Millennium Challenge Corporation’s recently completed five-year, $285 million compact with Mongolia, focused on the early diagnosis, treatment and case management of non-communicable diseases and injuries (NCDIs) like heart attack, stroke, diabetes, and more. The project concluded in September 2013 and promoted healthier lifestyles across Mongolia, a country the size of Western Europe. MCC and the Government of Mongolia chose to invest in the project because of the strong link between a healthy workforce and economic growth. The project helped introduce screening processes for the diagnosis and treatment of hypertension, type-2 diabetes, heart disease, and breast and cervical cancers. It also helped refine laws, policies and regulations to help the Mongolian government promote a healthier public. The project worked to address the major causes and risks of these diseases and incidents, which are pervasive and cause premature adult death and disability. The unattended problem ultimately affects labor force productivity and the economic well-being of Mongolians. Activities in the Health Project included training health workers, immunization campaigns, new hospital equipment, and working with food manufacturers to introduce more healthy recipes and food labeling—all of which are projected to benefit more than 1.7 million people and boost household income by $48 million over the next 20 years. The project funded improvements across the health sector, from educating medical professionals to ensuring health clinics throughout the country had the proper equipment. MCC and MCA-Mongolia, the local organization that implemented the country’s MCC compact, worked together on developing national clinical guidelines on prevention, detection and treatment of cardiovascular disease; the training of 740 medical professionals, including cardiologists, neurologists, physical therapists, and nurses; and the creation of a registry system to collect patient data and allow for doctors and nurses to follow up as necessary. The compact also funded the training of nearly 17,000 medical and administrative professionals, including clinicians and health care managers. Health screenings were made universally available, accessible and affordable to almost all families. 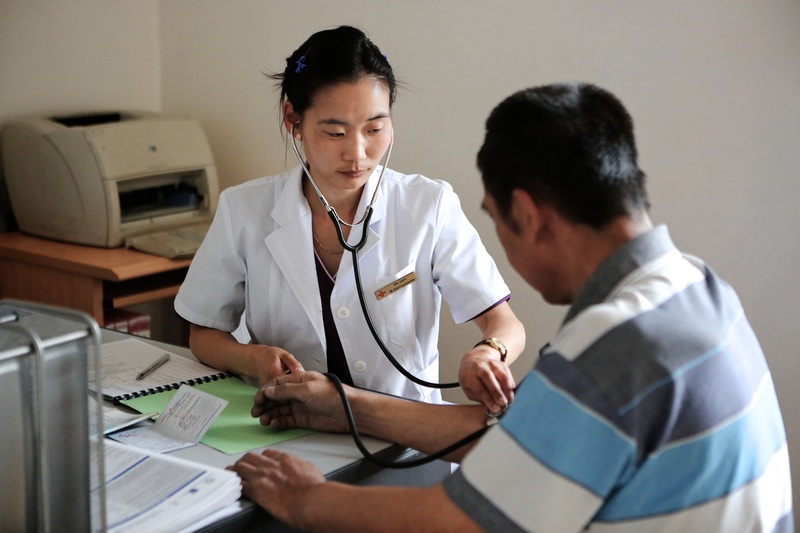 More than 550 primary health care facilities in all nine districts of Ulaanbaatar, and in all 21 provinces of Mongolia, were equipped and prepared to screen virtually every Mongolian age 40 or older for diabetes, breast cancer, cervical cancer, and hypertension. Plus, $3.1 million was invested for 83 types of state-of-the-art diagnostic equipment and supplies for local health clinics to serve Mongolians across the country, including throughout rural areas. The Health Project also encouraged local and national initiatives to promote healthy lifestyles at workplaces, schools and communities by awarding grants and supporting government initiatives to increase public health funding. The project boosted public awareness of risky behaviors, the need for—and benefits of—regular screening and testing and the need to respond quickly to stroke and other NCDI danger signs. Public awareness campaigns to promote healthier lifestyles included appearances by MCA-Mongolia officials on 23 talk shows, more than a million information pamphlets, 60 TV programs, and 30 episodes of a drama series that was so popular people requested it be re-aired. Furthermore, in a first for Mongolia’s blind, braille books on NCDIs were produced by the project. An advocacy effort led by the MCA-Mongolia Health Project strongly supported parliament’s early 2013 adoption of the national anti-tobacco law, which, among other things, restricts smoking in public places. The Health Project also awarded competitive grants to 219 organizations in the health sector and helped bring the world’s top researchers to Mongolia by sponsoring two international NCDI conferences in Ulaanbaatar in 2010 and 2013—the first conferences of this type in the country’s history. MCA-Mongolia also worked with private industry to promote better health, leading to a reduction of salt, sugar and fat in popular food brands. By 2013, the two major Mongolian bread factories had reduced salt content in their products by 12 percent, and a leading dairy producer now offers five reduced-sugar and three sugar-free products. The project also supported new food labeling standards to protect and inform consumers. By helping Mongolians of all ages and backgrounds improve their health, the country is better geared for a more prosperous future that will improve lives for all.